Author Tim Bruckner (SENSIBLE REDHORN, SHELL GAME) puts his own unique twist on the private eye tale by introducing the most intriguing of mysteries in TRUTH IS NO STRANGER, now available from Pro Se Productions in print and digital formats. The Truth is no stranger. He was as hard boiled as a Private Detective can get. He was sitting in his office, working on a report of his last case when she walked in. She was a knockout, in her short red velvet fur trimmed shirt, so short it barely covered the half-moons of her derriere. And she was tiny. Not five feet. But, holy cow, did she make up for it in spades. She sashayed to his client chair and slid into it. She tried the old, “I’ve got a friend who’s in trouble.” It didn’t work. It never does. They shared a couple of straight shots and she started to relax. Seems she took something she wasn’t supposed. A book. THE Big Book. Took it home to see what all the fuss was about. She was going to bring it back the next day. But, the next day it was gone. And if she didn’t get that book back to where it belonged there’d be hell to pay. HELL in all caps. 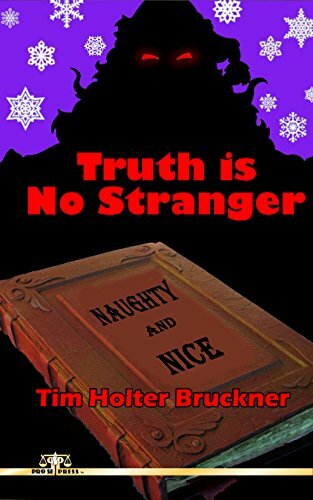 There’s never been a more hardboiled Christmas tale than Tim Holter Bruckner’s TRUTH IS NO STRANGER. From Pro Se Productions. With a fantastic cover and logo design by the author and print formatting by Marzia Marina and Antonino Lo Iacono, TRUTH IS NO STRANGER is available now at Amazon at https://www.amazon.com/Truth-Stranger-Tim-Holter-Bruckner/dp/154694396X/ref=tmm_pap_swatch_0?_encoding=UTF8&qid=1496763075&sr=8-1 and Pro Se’s own store at www.prose-press.com for 10.00. This terrific tale is also available as an Ebook, designed and formatted by Lo Iacono and Marina for only $2.99 for the Kindle at https://www.amazon.com/Truth-Stranger-Tim-Holter-Bruckner-ebook/dp/B07123X3V2/ref=tmm_kin_swatch_0?_encoding=UTF8&qid=1496763075&sr=8-1 and for most digital formats via Smashwords at https://www.smashwords.com/books/view/727159. PALM TREES, OCEAN BREEZES, AND MURDER! ‘CRIME DOWN ISLAND’ DEBUTS FROM PRO SE PRODUCTIONS!